Why does the Form 1040 look so different and how do I fill it out? What’s still deductible, what isn’t? If I have dependents, can I still claim them? Do business owners of non-US companies still have to pay tax? On February 27th, the AMCHAM tax committee will be hosting an event to cover these questions and more. Tax Committee Co-chairs Matthew Stevens of U.S. 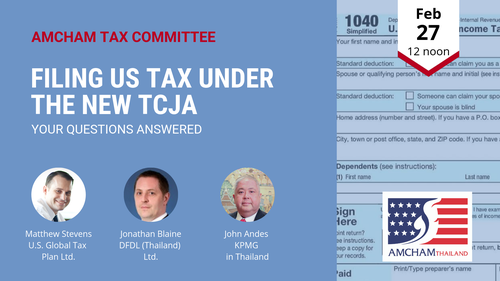 Global Tax Plan Ltd., Jonathan Blaine of DFDL (Thailand) Ltd., and John Andes of KPMG in Thailand will present on the key issues confronting perplexed U.S. taxpayers and be available to answer your questions. Do you have a burning question to ask? Please send us your concerns and questions and our co-chairs will do their best to address them in the session. Members: Free admission. Sandwich lunches may be ordered for 200 Baht. Non-members: 350 Baht, including sandwich lunch (prepaid only). Coffee, tea, water and soft drinks will be provided free of charge.